Ok, first off, sorry for the brief absence. Combination of things and sadly none of them interesting. To you, anyway. I mark my return by sharing with you all my new toy. 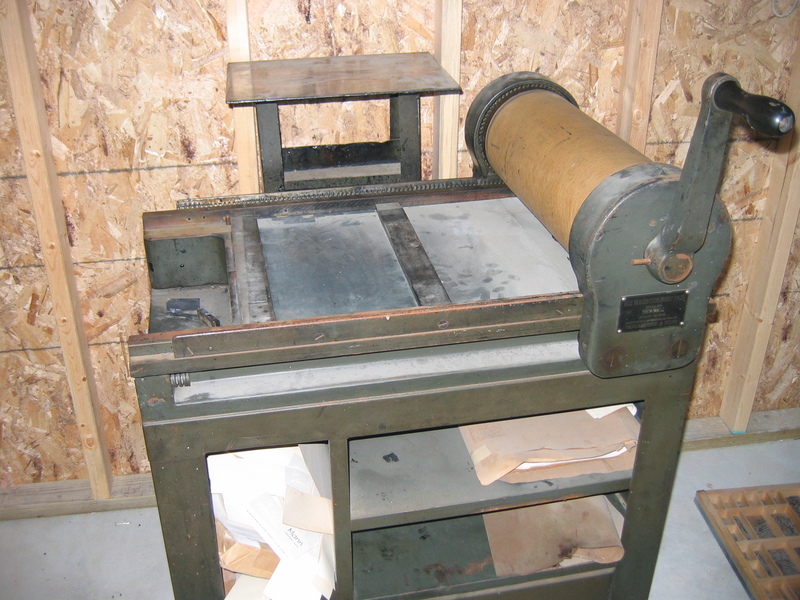 A Vandercook #1 proofing press built in 1939 and previously owned and operated by graphic arts company in the midwest. It’s my new baby. Like Pseudonym’s impending real baby (speaking of which dude, you should really get some sleep now and….go see movies, like every day, and and and boy you are gonna hate diapers, especially once they start eating meat — that last one was serious, it gets really bad when they hit meat). Anyway, like I was saying before the unsolicited advice, like real babies, this baby costs needs a lot of upkeep and extra stuff. Ink, brayers, etc. But once that has all been assembled. I will be in business, metaphorically speaking. I am sure when I actually start printing I will share some of my work here as well. Until then, enjoy a view of my new press. P.S. This picture was taken before I actually dusted it. It looks even better now. This entry was posted on July 3, 2008 at 8:37 am and is filed under Uncategorized. You can follow any responses to this entry through the RSS 2.0 feed. You can leave a response, or trackback from your own site.